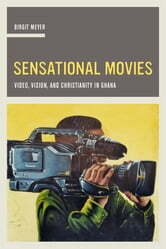 Birgit Meyer analyzes Ghanaian video as a powerful, sensational form. Colliding with the state film industry’s representations of culture, these movies are indebted to religious notions of divination and revelation. Exploring the format of "film as revelation," Meyer unpacks the affinity between cinematic and popular Christian modes of looking and showcases the transgressive potential haunting figurations of the occult. In this brilliant study, Meyer offers a deep, conceptually innovative analysis of the role of visual culture within the politics and aesthetics of religious world making.